On this Thanksgiving holiday, the economy itself might be thankful if Congress would take a machete to the regulations strangling business and job creation. From transportation to trade, from communications to banking and from telecommunications to technology policy, policy makers of both parties have at times challenged the moral legitimacy and economic rationality of federal regulatory intervention. For example Democrats helped spearhead transportation deregulation decades ago; both parties rolled back unfunded mandates in the 1990s. Regulations are frequently anti-competitive and anti-consumer, annually costing consumers hundreds of billions of dollars. The Small Business Administration, in a study by Mark and Nicole Crain, peg today’s cost at $1.7 trillion. Policymakers still largely do not know the full benefits and costs of the regulatory enterprise. Meanwhile, regulatory agencies grow in power and budget; simply look at EPA carbon-dioxide regulation campaign, FCC’s net neutrality hunger, and the rules-to-come from the health care and financial reform bills. American companies just had their best quarter ever, raking in profits at an annual rate of $1.66 trillion, Catherine Rampell reports in the New York Times. 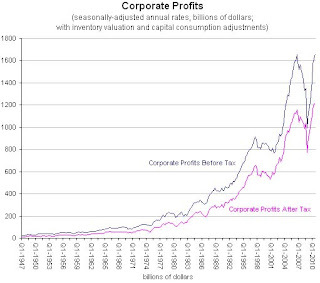 Corporate profits have been on a roll for the last year, but the unemployment rate is frozen between 9 and 10 percent. What gives? There are all sorts of credible explanations for why profits are recovering faster than jobs, including but not limited to: (1) Unemployment is a lagging indicator anyway, because companies don't hire in big batches until they have a dependable flow of income; (2) Executives have become more obsessed with earnings reports since their compensation became more tied to stock prices in the 1990s; and (3) Technology and globalization have nibbled away at middle-education, middle-pay positions. If you read Crews' article, you get the impression that regulation is destroying business and job creation, but if that was the case, why have businesses had their best quarter ever? I also thought it was interesting that Crews stated that "policymakers still largely do not know the full benefits and costs of the regulatory enterprise," meaning he doesn't know anything good about regulation but he can surely theorize many bad things about them. Policymakers may not know the full benefits of the "regulatory enterprise," but I think the quarterly profits of $1.66 trillion is a good start. In order for big companies to add millions of workers per year, they need money. Lots of lots of money. More huge quarters like this one, on the back of rising consumer spending and falling productivity growth, will force companies to add workers to keep up with demand. More workers working will grow demand get even more workers working. What kind of intelligent thing does Crews have to add? Nothing. So it is bad that businesses are trying to plan for what be done to them in the future through govt regulation and taxes. Some one takes their car to the garage to be fixed, the mechanic says that it may be something very simple to fix and cheap. Now the car owner knows a little bit about cars and thinks that the fix will not be simple and cheap so he decides not to buy that new Flat screen TV so that the money can saved. Three days later the owner goes to pick up the car and mechanic tells the owner that their was multiple problems that needed to be fixed and your bill is three times what was originally thought it would be. The car owner is no happy that he did not buy that new flat screen because the money was needed to pay the repair bill. How is this any different than what businesses are doing today, they have to save all the money they because of the uncertainty of what the new laws and regulation are going to cost int he future. 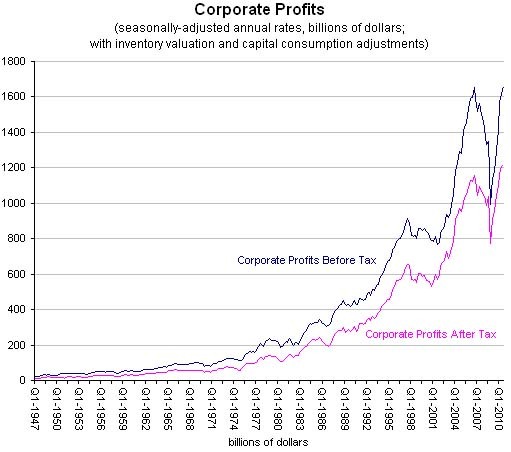 If you read Crews' article, you would see that he wishes "Congress would take a machete to the regulations strangling business," meaning it is his belief that there are regulations currently in existence hindering the growth of business, but the fact that American corporations posted their biggest profits would prove that with these "strangling" regulations, businesses are still capable of thriving. The argument that businesses are withholding cash reserves because they fear future regulation is bogus. Corporations must answer to shareholders, and if those shareholders have no confidence in the corporation's ability to survive, the corporation is done for. Just look at the automotive manufacturers that accepted the government bailouts compared to those that didn't - they lost all investor confidence because they were not capable of surviving, and it wasn't because of regulation, but because of their failure to be competitive and their inability to operate in periods of a downturn. With the economy still shaky, with some fearing a double-dip recession, it would be the logical decision for a corporation to save their money to weather any future storms. Remember, the previous storm was a partially the result of deregulation. I assume you are referring to GM & Chrysler when talking about automotive manufactures bail outs, since Ford was the only one who did not take any bail out money and prospered because of that fact. Regulation have certainly played in a part in why our automotive companies were and are in such bad shape. We have a govt that continues to regulate the companies to manufacture cars that meet a federally set cafe standard. Another reason the car companies are hurting is due to the wages that have been negotiated with the unions. When the economy turns down care sales also drop of but a car company can not has to fight with the union to able to reduce the number of employees that are working at a plant. Before you think that I do not like union employees, I only have a problem with the leadership of the union and not the people that are paying the dues. You are right about corporation having to answer to share holders, what do you think would happen if the share holders are told that the CEO did not take into consideration what the possible cost for the new health care laws and how it is going to effect the profits of the company when it is fully in place? If that CEO does not take this into consideration they should be fired on the spot. I happen to be self employed, guess what I am sitting on all the profits I can and only hiring the bare minimum people I need to do the work. The reason for this is I have no idea what taxes are going to be next year, the new health care cost, or what ever this lame duck congress is going to pass at my businesses expense. The money I am sitting on to slated to pay what ever the govt throws at business to fund their pet projects, I only hope I have enough set aside. Deregulation, lets see when a commodity is regulated the price for it is artificial. When it is deregulated the commodities price will be set by what ever the market will bare. When prices get to high one of two things will happen, 1. people will by less of that commodity which in turn leads to lower demands and companies lowering the commodities price to help increase demand, 2. some one will start a rival company to supply the commodity at a lower price which leads to competition . Either way the end consumer wins because eventually the price of the commodity does come down. Kevin- Do not confuse them with the facts, they can not handle it. They have their own agenda and anyone who dares to point out the fallacies in their posts is of course a Maoist, Leninist, Marxist, you name it. They have absolutely no idea how close this country came to an economic meltdown. Obama has not receive any credit because he focused on other issues other than the economy. As a result, he let the Republicans set the agenda because the American people were worried more about their job, than their health care. Have a Happy Thanksgiving. Anon - You make some very interesting points. I am guilty of over generalizing, but I do believe that the amount of companies (small businesses and corporations) stockpiling cash because of regulatory uncertainty is a minority. As for car companies, I agree with you on their predicament with the unions - I find unions to be useful for certain purposes, but I find them to be too inflexible - during the whole bailout of the auto industry (which I opposed), I thought it was interesting that these companies faced bankruptcy and some of these unions were reluctant to give. Didn't they realize that if the companies went bankrupt they would be out completely? As for your comments on deregulation, I agree that some regulations are bad - I would be interested in seeing farm subsidies disappear - but I find it hard to believe that competitors will spring up and compete in the marketplace. It would be extremely difficult to establish a supply chain great enough to compete on a national scale - even regionally. This is why I agreed with the public option - the federal government had the resources to create a national system that people could buy into. I truly believe corporate insurers either lack the interest or the capability to insure everyone... and still post a profit. to HuskersLoveBo and Anonymous - have a happy Thanksgiving!